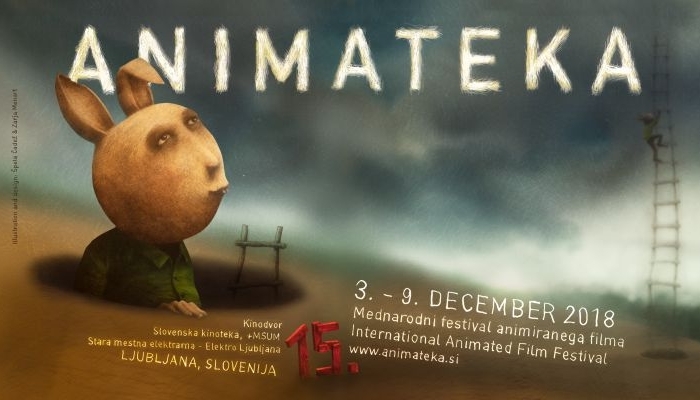 Animateka is an international animated film festival taking place in Ljubljana at the beginning of December. This year’s 15th edition is being held from December 3rd to 9th in Kinodvor, Slovenska Kinoteka and Stara Mesna Elektrana. Besides being present at the festival, Croatian projects and film professionals are also participating in the first module of a full-year CEE (Central and Eastern Europe) Animation Workshop taking place alongside Animateka, with a focus on content development. The festival is geared toward the latest short animated film productions from Eastern and Central Europe, and was founded in 2004 as a logical extension of the monthly animated film programmes held in Slovenska Kinoteka (Cinematheque) and curated by Igor Prassel, Animateka’s programme director. Competing in the Central and Eastern European programme are: Two for Two by Jelena Oroz, Cyclists by Veljko Popović, A Demonstration of Brilliance in Four Acts by Lucija Mrzljak and Morten Tšinakov, How Steel was Tempered by Igor Grubić, From Under Which Rock Did They Crawl Out by Danijel Šuljić, and One of Many by Petra Zlonoga. The Central and Eastern European Panorama will screen: Scream by Petra Balekić, Right Now by Katrin Novaković, Saturn in Leo by Anna Šagadin, A Dungeon Artist by Davor Međurečan, Malleus Dei by Dino Krpan, and Paranoja paranoje by Katarina Jukić. The Elephant in Competition will screen Nutz by Denis Alenti and White Crow by Miran Miošić, while European Young Talents will screen Marko Belić’s film Flimflam. Other programmes will screen the world premiere of Martin Babić’s film The Ballad of Pipe and Necklace, as well as Anja Kofmel’s Chris the Swiss and Bobo by Andrej Rehak, while the ‘Jury Presents’ programme will screen Špela Čadež’s Nighthawk. Chris the Swiss’s Croatian co-producer, Siniša Juričić, along with the film’s director Anja Kofmel, are participating in a masterclass being organized through the AnimatekaPRO platform, where they will describe to attendees the challenges they faced while working on the Swiss-Croatian-German-Finnish co-production. The festival platform Animateka Pro Pitch enables producers and animators from ex-Yugoslav countires to pitch their projects in development. Two projects made in a Zagreb Film production will be presented there: Agualia, 3D animated film by Vladislav Knežević and From the Ghetto by Lucija Bužančić. Films will be presented by their authors and the executive producer Andrijana Vidaček. More details regarding the festival are available at Animateka’s official website. Dorotea Vučić’s feature animated film project Lady Pirates was chosen to participate at the CEE Animation Workshop. The project’s development was co-financed by the Croatian Audiovisual Centre, and produced by Miljana Dragičević and 3D2A Animators. 12 animated projects were chosen to participate in the workshop, of which four are feature length, four are series, and four are short films, along with five participants without projects. The first module of the CEE Animation Workshop is taking place from November 30th to December 6th in Ljubljana as a part of the Animateka International Animated Film Festival. Participating at the CEE Animation Workshop, along with Lady Pirates, is the feature length project Hello Isabelle by writer and director Marjan Alčevski and produced by Siniša Juričić. This year’s tutors are experienced script advisers Rita Domonyi and Phil Parker, while the group sessions will be led by renowned producers Ewa Puszczyńska and Ole Wendorff-Østergaard. A case-study will also be organised during the workshop, focusing on Chris the Swiss, an animated documentary film directed by Anja Kofmel. A lecture will be held by the film’s Croatian co-producer Siniša Juričić (Nukleus Film). Croatian producer Vanja Andrijević (Bonobostudio) will participate in one of the panel discussions being organised during the CEE Animation Workshop.